Coffee crumb cake: This cake was the first rhubarb dish I truly enjoyed – and when I brought it into work it was devoured! For the Brits out there, a ‘coffee cake’ has no coffee in it, it’s just a typical cake to have with coffee, usually with a crumb topping – you know the Americans love a sugary breakfast!! Anyway – try this cake and do it soon folks. ( it also works beautifully with other fruits like plums or apples…) Or if you’re looking for a more traditional cake – this simple rhubarb recipe works great as a full-size cake or cupcakes. 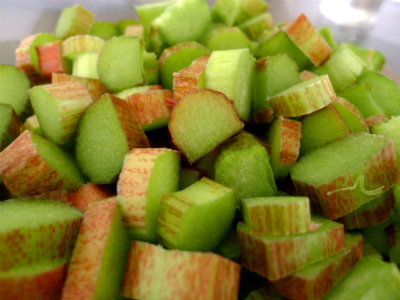 Rhubarb curd: Many people have heard of lemon curd – a rich, sweet and creamy fruit preserve which is used on toast, as a tart filling, on ‘pancakes’ (known as crepes in the USA), on shortbread biscuits or for many other uses similar to jam. 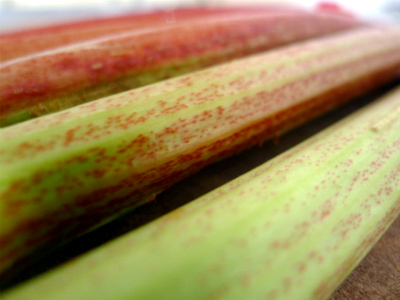 Well rhubarb curd can be used in the same ways but seems so much more special since it’s so seasonal and so lovely and pink. on May 10, 2011 at 2:26 am | Reply Lauren B. 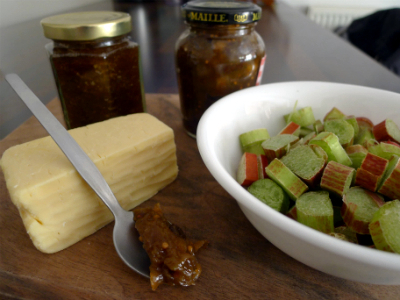 Thank you for sharing–the rhubarb chutney recipe looks delicious. It is such a strange little veggie, but once you know what to do with it, it is certainly addicting!